Most Rev. Michael Brehl, Redemptorist Superior General, recently visited our confreres in Port-au-Prince, Haiti. He offers an eyewitness account of conditions there, and shares how the Redemptorists are assisting those who’ve lost everything. Here are excerpts of Father General’s report. To read the entire story, click here. 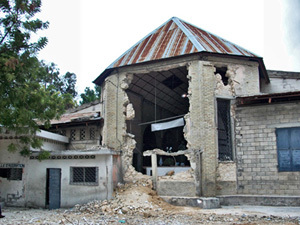 If you would like to support the Redemptorists’ relief efforts in Haiti, click here. Please enter "Haiti" in the "in memory" box. With our confreres, I slept in tents ‘à la belle étoile’, (under the stars) as they say. Our confreres are sharing the situation of the ordinary people. Our two houses, St. Gerard’s Church, St. Gerard’s School, the youth skills training centre, medical clinics, water purification, and seminary are all destroyed and will need to be rebuilt. With the help of funds raised by Redemptorists and NGO’s, our confreres are supplying many of the poor parishioners with water, with beans and rice, and with tents to give them shelter. Despite their personal living situations and the fates of their own families, our brave young confreres continue to reach out to help others around them. Photo and report courtesy of Scala.